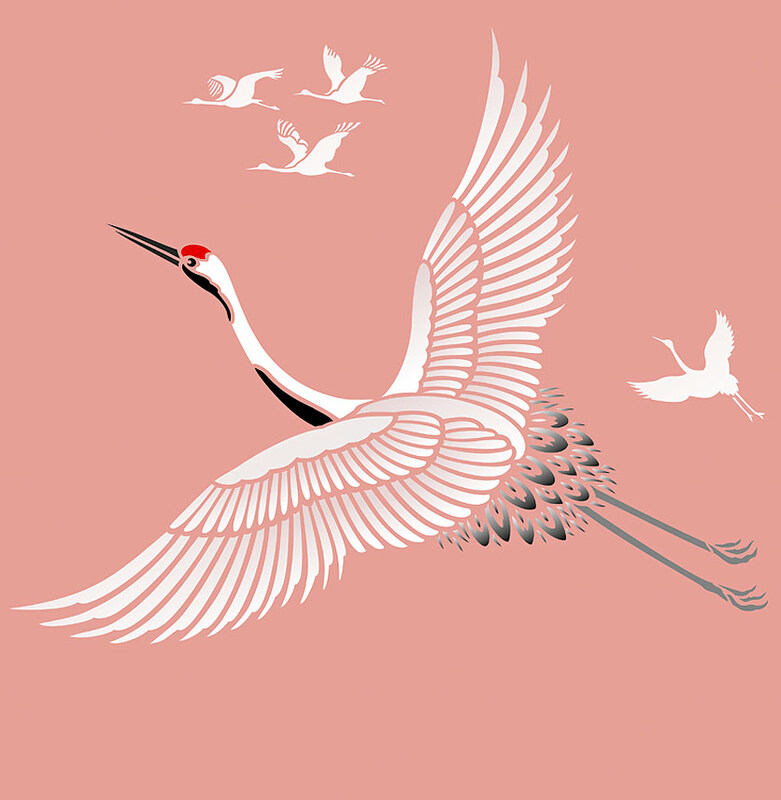 The graceful Large Flying Cranes Stencil depicts a large Red Capped Asian Crane and captures the beauty and elegance of these stunning birds in flight and will enable you to create simply breath-taking murals and features walls, as well as decorative panels and fabrics. 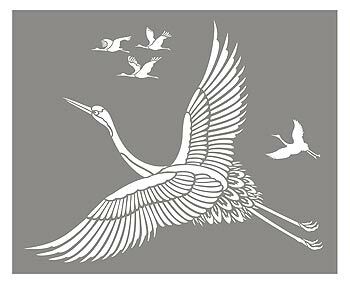 Large single sheet stencil with one large flying crane and three cranes flying in the distance. See stencil layout and size specifications below. 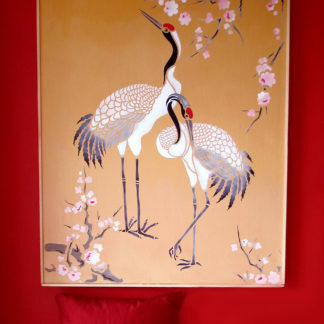 The elegant Red Capped Asian Cranes are held in high regard throughout China, Japan and across the Himalayas, where they are perceived to bring luck and good fortune and treated as sacred birds. Each year they undertake the arduous task of flying over the highest mountains in the world aloft their spectacular wings circling on thermal currents high above the mountains. Above – create this warm and stunning setting with the Large Flying Crane Stencil repeated on a Chinese red painted wall – a flying crane mural, with the cranes spaced apart and overlapping to give the impression of a flying group. Stencil Paints used here – Vanilla, Arctic Grey, Jet Black and Azalea. Wall finished with Matt Acrylic Varnish tinted with a little Yellow Ochre Universal Tinter to ‘bring’ the mural together. Below – close up detail of the same finish. 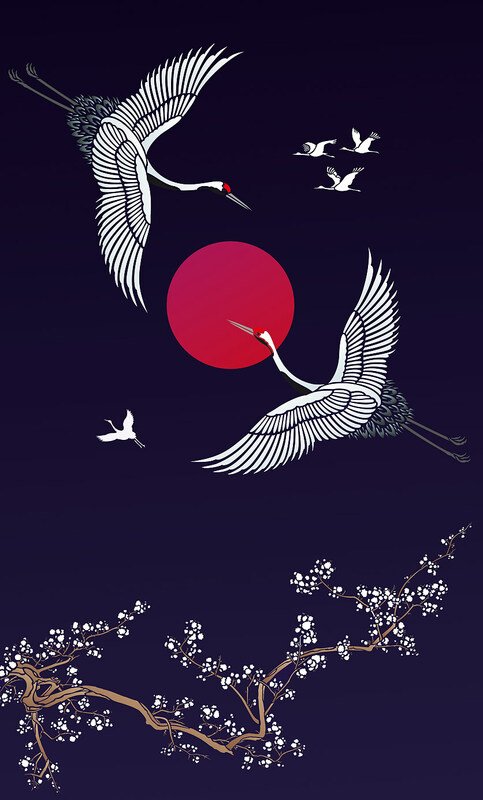 Above – the Large Flying Crane Stencil and the Cherry Blossom and Moon Stencil on a striking midnight sky background and blood red moon, for impactful Eastern style. Top bird stencilled in reverse. Moon taken from Large Cherry Blossom Details Sheet. 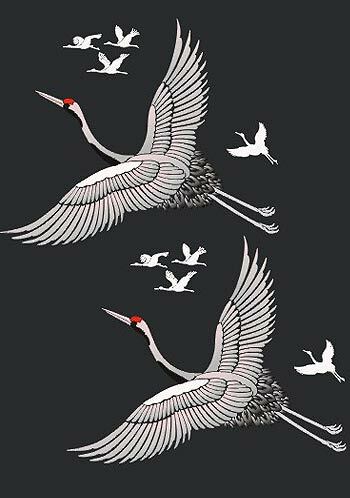 Stencil in the natural tones of white, grey, red and black or in silhouette colours on striking backgrounds for beauty and impact, or on classic gold for truly classic style. 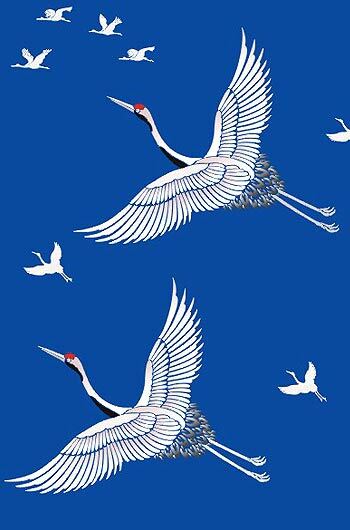 Above – the Large Flying Cranes Stencil is repeated on a rich deep azure coloured background – stencilled in Ice White, Orchid, Jet Black and Very Berry Stencil Paints. Above – create this beautiful finish with the Large Flying Crane Stencil shown here with the Japanese Blossom Stencil – stencilled in Orchid, Damask Rose, Arctic Grey, Jet Black and Coffee Bean Stencil Paints. 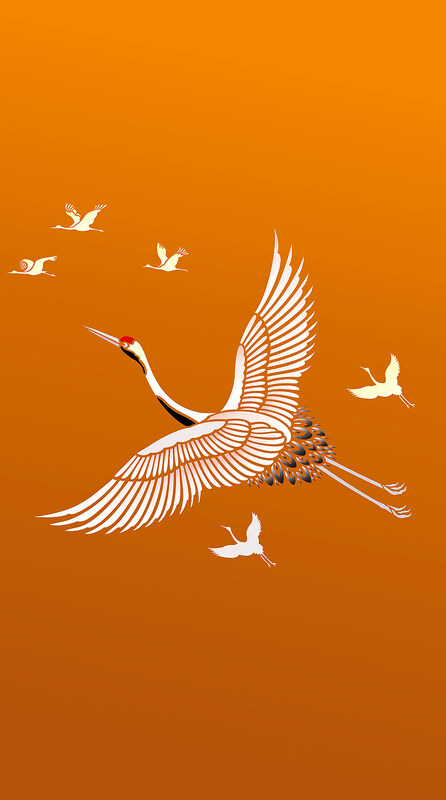 Above – close up detail of the Large Flying Cranes on a warm peach background – stencilled in Ice White, Vanilla, Orchid, Shoreline, Very Berry and Jet Black Stencil Paints. 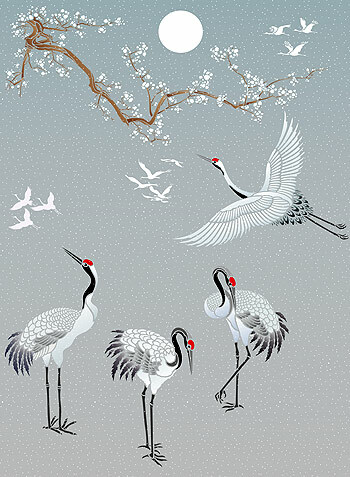 Above – Create this sumptuous mural with the Large Flying Crane, shown here with the Large Standing Cranes and Japanese Blossom Stencils. Stencilled on a softly painted graduated gold and apricot background, in Ice White, Vanilla, Shoreline, Arctic Grey, Jet Black, Very Berry and Orchid Stencil Paints. See below right for graduated painting techniques. A graduated painted background can be achieved by using two similar tones of emulsion paint (latex) and a tinted varnish glaze over the top. This technique will not work with radically different colours – keep the tones similar so mixing is easier. Mix a third of each colour together to create a mid-tone colour and paint the wall in horizontal bands dark to light, brushing the colours lightly over each other at the joining bands to create as softer join as possible. Keep strokes long, smooth and horizontal. Mix a varnish glaze using 2/3rd Acrylic Matt Varnish, 1/3rd Acrylic Scumble Glaze. Add a little water if the glaze is much thicker than the consistency of double cream. Tint the glaze with several drops of Universal Tinter to create a transparent glaze a couple of shades deeper than the middle tone of your painted wall. Brush the glaze over the wall and soften in long smooth strokes using a soft brush. 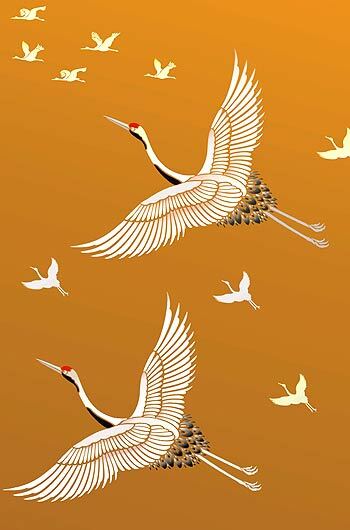 Above – the Large Flying Crane Stencil on a regal gold painted background, stencilled in Ice White, Vanilla, Evening Primrose, Orchid, Jet Black and Very Berry Stencil Paints. 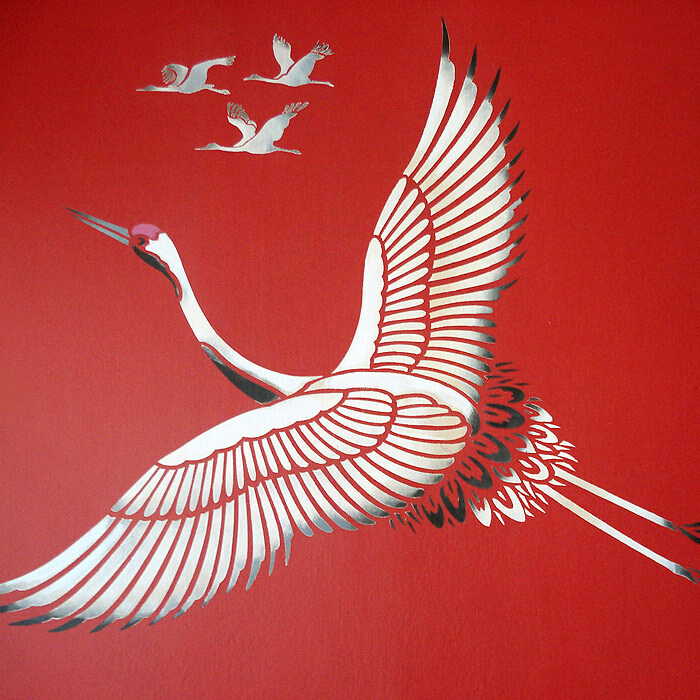 Below – the Large Flying Crane Stencil is repeated and stencilled with the same colours. 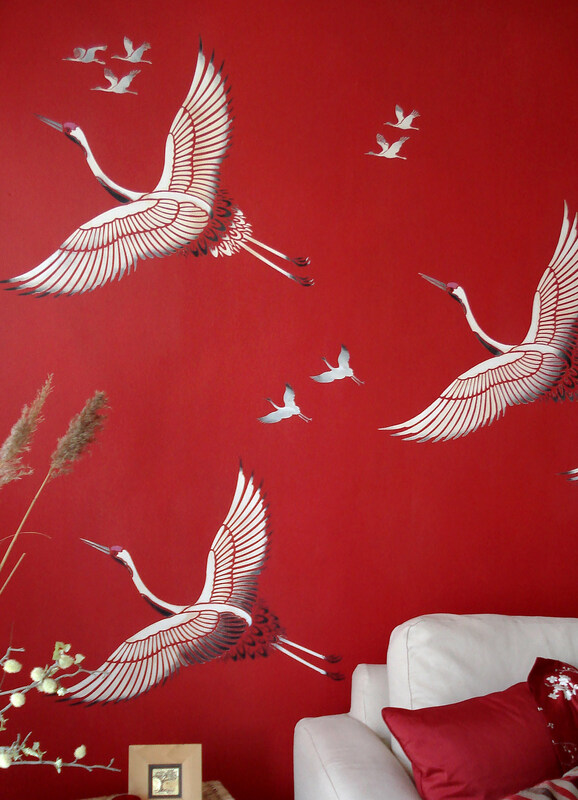 Above – the Large Flying Cranes were stencilled on one red feature wall and styled with cushions in contrasting silhouette and striped fabrics. 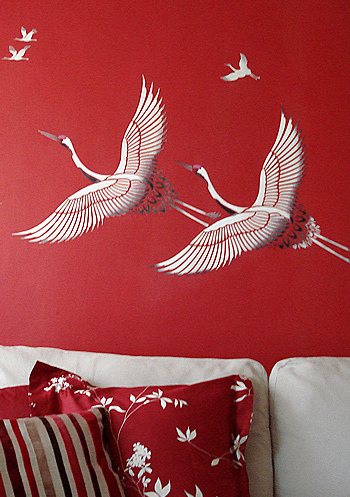 Above – close up detail of the Large Flying Cranes on the red painted wall (colours as above). 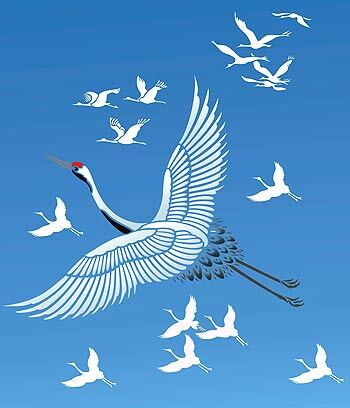 Above – the Large Flying Crane Stencil is shown with birds from the Flying Crane Theme Pack Stencil – stencilled in Ice White, Jet Black, Arctic Grey and Very Berry Stencil Paints on a rich sky blue background. See below for graduated painting techniques. 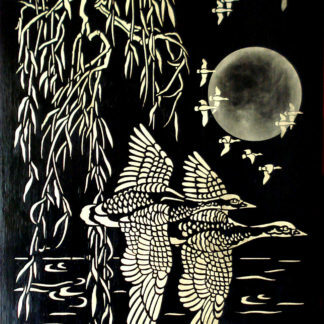 Above – the Large Flying Cranes repeated as a flying pair on a dark charcoal background – stencilled in Ice White, Orchid, Shoreline, Very Berry and Jet Black Stencil Paints. 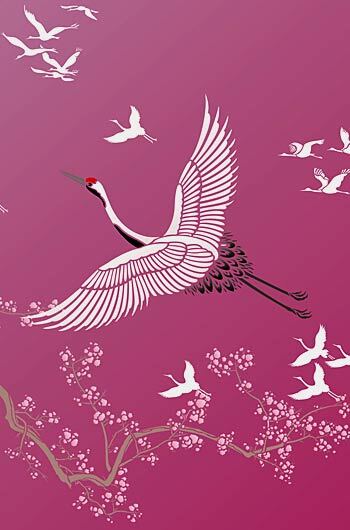 Above – the Large Flying Cranes is stencilled here with the Flying Cranes Theme Pack and Cherry Blossom Bough Stencils on a rich purple and magenta graduated background. Stencilled in Ice White, Orchid, English Rose, Very Berry, Jet Black and Mocha Stencil Paints. 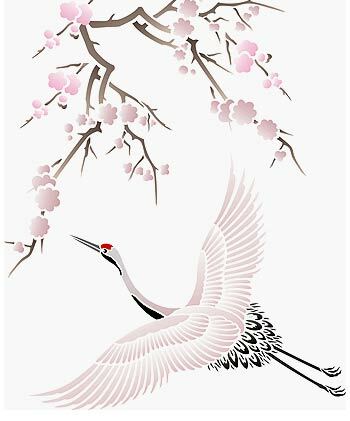 Above and below – create these great mural effects with all of the Crane Stencils in this range – the Large Flying Cranes, the Large Standing Cranes, Large Crane Stencil and Flying Cranes Theme Pack Stencils, with the Cherry Blossom and Moon Stencil and the Snow Stencil applied over the whole scene. Easy to use one layer stencil on one sheet of 125 micron mylar. 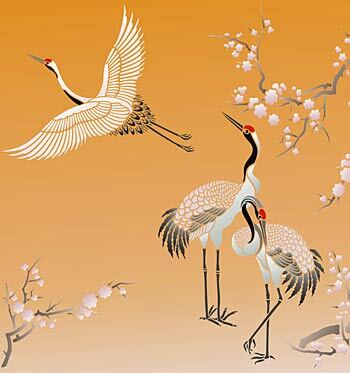 The large crane measures up to 68cm (26 3/4″”) wide from beak to toe and 54cm (21 1/4″) between wing tips. The small crane to the lower right measures up to 12cm (4 3/4″”) wide. 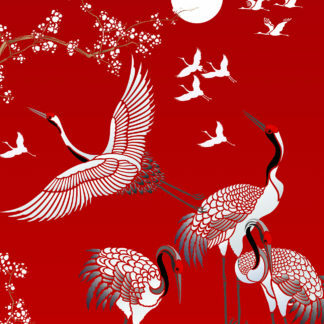 The small cranes in the group of three at the top of the sheet measure between 8cm (3″) and 12cm 4 3/4″) wide. Sheet size 74cm (29″) wide x 60cm (23 1/2″”) deep. Left – shows the layout of the stencil sheet of this beautiful design.